A scientific article that says terrorists could poison thousands of people through the United States' milk supply — withheld at first at the government's request — is being published despite continuing objections after the National Academy of Sciences concluded it wouldn't help attackers. 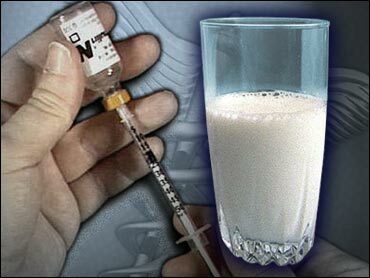 The study by Lawrence M. Wein and Yifan Liu of Stanford University discusses such questions as how terrorists could release botulinum toxin into the U.S. milk supply and what effective amounts might be. Bruce Alberts, president of the Academy, said in an accompanying editorial that a terrorist would not learn anything useful from the article about the minimum amount of toxin to use. "And we can detect no other information in this article important for a terrorist that is not already immediately available to anyone who has access to information from the World Wide Web." In fact, he said publication of the article by the Academy could instead be valuable for biodefense. Science has a long tradition of publishing new information in peer-reviewed journals, providing an opportunity for other researchers to confirm findings and advance to a next step. However, following the Sept. 11, 2001, attacks, some government officials have raised concerns that by obtaining biotechnology data, terrorists might be able to engineer deadlier versions of diseases. The paper and editorial were published Tuesday on the Academy Internet site and will appear in the July 12 print edition of Proceedings of the National Academy of Sciences. The paper was originally planned for publication on May 30, but was withheld at the request of Stewart Simonson, assistant secretary of Health and Human Services, who contended the paper was a "road map for terrorists." Simonson said the paper provided too much detail on potentially vulnerable areas of the milk supply, processing and distribution systems and argued that its publication "could have very serious health and national security consequences." Health and Human Services spokesman Bill Hall said Tuesday the agency still feels the material shouldn't have been published. "We respect the Academy's position but we don't agree with it," Hall said. The "consequences could be dire and it will be HHS, and not the Academy, that will have to deal with it." Wein said Tuesday he was surprised when Simonson raised objections to the paper. He said he had met with officials of HHS, the White House, the Department of Homeland Security and the dairy industry last fall to discuss the paper. After that, Stuart Nightingale, an emergency preparedness official at HHS, asked to see the paper, Wein said. He said he sent it to Nightingale, and, when he didn't hear back, he assumed there was no problem. After Simonson objected to publication, officials of the Academy and government agencies met to discuss the paper. "I think PNAS acted professionally," Wein said. It was correct of them to delay the paper and listen to the government concerns, he said. A key question is the percentage of botulinum toxin that would be inactivated by milk pasteurization, and Alberts, the Academy president, said that in those discussions the Academy learned improvements had been made to the process since the terrorist attacks. Because of those improvements the nation may be safer from such an attack than the paper estimated, he said. However, Alberts added, many food protection guidelines are voluntary and there is "everything to be gained by alerting the public and state governments to the dangers so that they can help the federal government in its ongoing, highly laudatory, attempts to reach 100 percent compliance with its guidelines." The report describes the milk supply chain from cow to consumer. It describes points where toxin could be introduced, such as a holding tank at a farm, a truck transporting milk to the processing plant or a raw milk holding tank at the plant. One gram of toxin could affect as many as 100,000 people and 10 grams up to 568,000, the researchers concluded. A gram is about the weight of a paper clip. Wein and Liu suggest a number of steps to prevent an attack including locking of tanks and trucks when not in use. They urge the government to require similar protections for the food industry in overall. Last September the National Research Council, an arm of the Academy, urged continued open access to scientific research. It also suggested creation of an advisory board to review research and report on any security implications. Then-HHS Secretary Tommy Thompson ordered establishment of the National Science Advisory Board for Biosecurity. The panel is scheduled to hold its first meeting on Thursday. The National Academy of Sciences is a private institution that provides scientific advice under a congressional charter.